The Gathering have created a masterpiece in Nighttime Birds. At once hopeful and heart wrenching, optimistic and apocalyptic, The Gathering seem to evoke all the tragedy and longing of the human spirit. 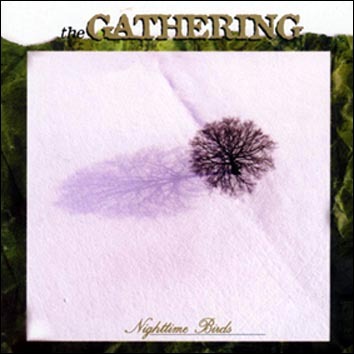 In the making of Nighttime Birds The Gathering have managed to combine a wide variety of musical influences into a distintinctive and powerful brew. The album absouluteluy defies classification, dragging the helpless listener into wonderfully addictive web of sound. Any previous misconceptions of the band being either Gothic or Doom metal have been totally shredded, spawning a totally unique and magical album. The soaring vocals of Anneke Von Giersbergen act as guide through the emotional, almost Pink Floydian, soundscapes constructed by the rest of the band. It is her excellent voice that really seems to define The Gathering. The songs are generally slow, moody, and drenched with emotion. The lead-off track "On Most Surfaces" is one of the highlights, and the excellent "Kevin's Telescope" is a powerful exploration of human longing. "Third Chance" is conspicuous as it is really the only up-tempo somg on the album, but provides one of the most addictive hooks on the record. Nighttime Birds is an album for the ages, with seemingly limitless replay value. The uncanny ability of the band to stir up simultaneous sensations of love, anger and desperation is indescribable and must be experienced. Less metallic but no less potent than their previous album, Mandylion, Nighttime Birds shows exponential improvement for the band. Admittedly, this album veers dangerously close to not being metal anymore, but those open-minded enough to appreciate bands such as Pink Floyd or Anathema's Eternity should have no problem embracing this album.